Some doctors have claimed that young men could be jeopardizing their sexual health by taking the world's best selling anti-baldness drug. According to researchers, finasteride - sold in UK as Propecia - can cause serious side effects and that the drug's labelling is inadequate. The prescription pill is extremely effective at stopping hair loss and in clinical trials nine out of 10 men didn't lose any more hair over a five year period. Drugs' company Merck, which manufactures Propecia, claims on its website that less than 2pc of men could suffer sexual side effects, reports the BBC . It mentions things like difficulty achieving an erection, but says the problems will go away for men who stop taking the drug. There are doctors in Ireland and the US who claim that the drug's labelling is inadequate. Merck said they continually monitor its safety and have recently changed the labelling after reports of sexual side effects continuing after people had stopped taking the drug. 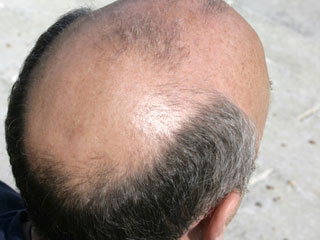 They also claim those cases are extremely rare and could be caused by something other than Propecia itself.